This is in reference to my earlier letters dated 20-11-2010, 18-12-2010, and 13-01-2011. We are extremely grateful to you for the timely intervention, by which a constitutional breakdown has been avoided in the diocese. 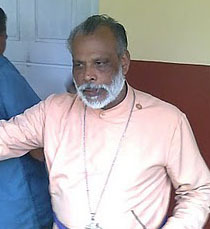 Sadly, Bishop Kuruvilla continues to remain belligerent. Bishop and his coterie are already making efforts, both in Chennai and Ernakulam, to get an ex-parte injunction against the officiating committee from taking charge. 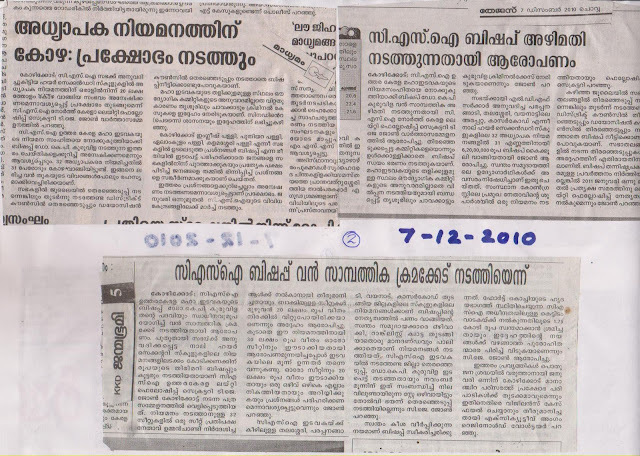 Yesterday, 19 January 2011, he called a few presbyters, district council members and church workers to the diocesan office at Shoranur. It is learned that he tried to compel them to sign on blank papers under the pretext of sending a memorandum to the synod. Fortunately, most of them refused to sign, but only to be threatened by the bishop with dire consequences. We have also learned that he is organizing a few people to prevent the members of the officiating committee from entering the diocesan office and taking charge on 25 January 2011. We feel the cause of this panic on the part of the bishop is nothing more than his fear of being exposed further of his nefarious financial deals. Since June 2010, Bishop Kuruvilla has collected around 8.5 crores through the appointment of thirty two teachers in four of the newly sanctioned higher secondary schools. 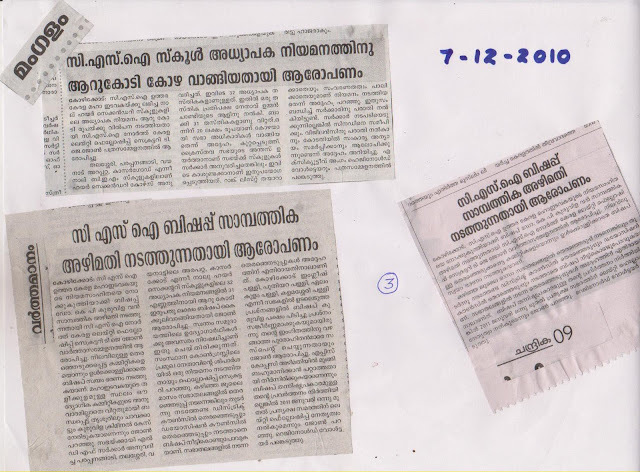 This is excluding the huge sums of money that has been collected for appointments in Malabar Christian College and other aided schools. This is a fact that is known to everyone in the diocese and has been covered well in the local media. In the executive committee that met on 20 October 2010, questions were raised regarding this and the treasurer admitted to have received only Rs. 1.5 crores. When asked about rest of the amount, bishop responded that the amount received cannot be divulged and the executive committee members have to just trust him on this matter. In the light of the present change in administration, the amount collected by the bishop would have to be naturally handed over to the administration with a detailed account informing from whom the money has been received. The more pertinent question is in whose possession is this huge sum of money. Kindly note that since the government and its investigative agencies are already aware of this financial misappropriation, the appointments will never get approved. This is all the more so considering the money was collected against vacancies which were not approved in the first instance and for which no appropriate rank list has been prepared. It is learnt that the bishop has promised the candidates that he would return their money back in the event of their vacancies not being approved. If that is so, the liability of that will be on the diocese. Therefore, it is important that a detailed enquiry be conducted on this matter at the earliest. If the accurate figures of money collected is not ascertained and if that money is not recovered from the bishop and his associates, then the diocese may face a huge liability coming close to Rs. 10 crores. 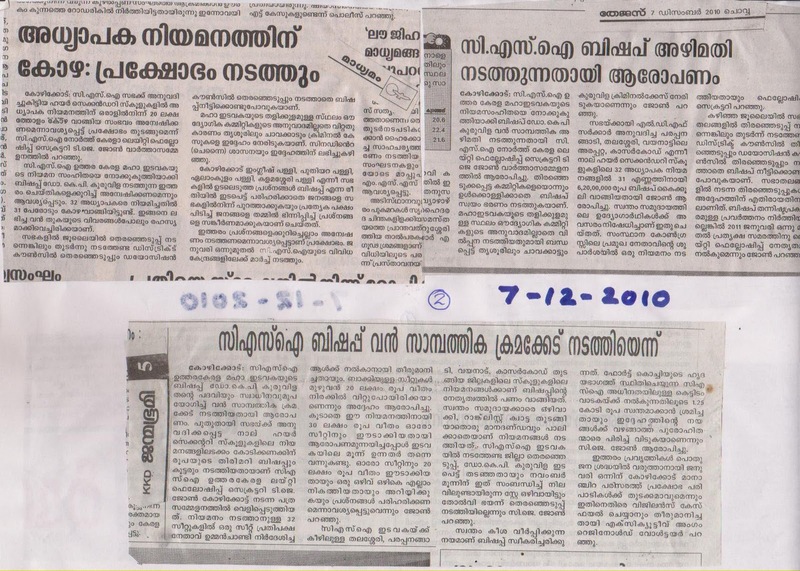 Attached are some of the press reports from the local dailies on the matter. Now I have learnt, from reliable sources close to Bishop K P Kuruvilla that he is trying desperately to get suspended so that he can walk away without accounting and handing over physically this money. He must know the pain of suspension. We use to pray for you everyday. All your allegations are true. A common man can not imagine this type of corruption. Hope you will find out right solution for this problems. Please help candidates like me. 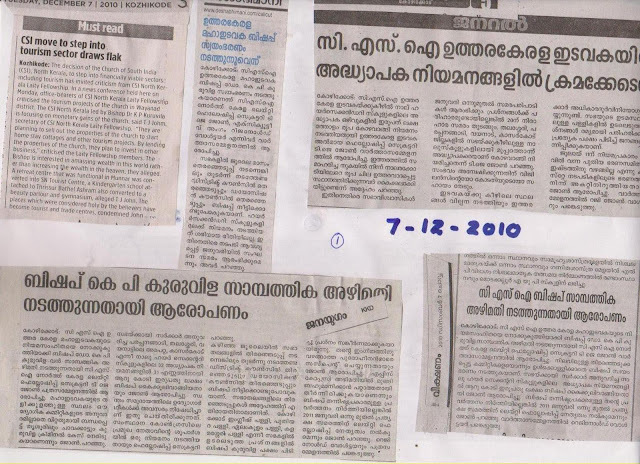 The bishop has no authority to instruct the heads of school to obey his directions.But unfortunately unlike other thirumenees bishop kuruvila was threatening the heads of schools.He never came to the reality that he is a spiritual leader.All teachers in our management were totally confused to note the unauthorized responsibilities he took himself in kozhikodde and palakkad managements. When you put a complaint on the Bishop with enormous amount of money, there should be a proof that he has done on his own. You should be specific on who has given it and their bank account with transaction details. You cannot make false allegations in a public site on the person without having the full details. I would like to make a point here that, bribing for any gain is also a criminal case, means giving bribe is also considered in the same level as taking bribe, so in this case both the parties should be charged if it has done. Did Bishop has asked for the money OR the administrative persons, You should be specific on that. When you make allegation you should also be sure that you are expecting any gain and money. There is no doubt that our church has to go through a reformation. We need to arise and work together with a motive to reform the church instead of just waiting in line with a question, Who will bell the cat? The reformation needs to happen in the individual. People should turn to God and to the word to understand what is the purpose of a church and why we are all in revolt against Kuruvilla. Today the Word of Salvation has not reached the mass in the CSI church. Let us creatively think what could be done to bring in this reformation inside our church. We also need to give a though of what we can do as individuals and the answer is simple. Let us decide to talk about Christ to our fellow members and make sure that all the people in our churches turn to God and to the Word. This is real reformation. If we are able to do so, then we are bringing in the reformation in the hearts & minds of the people, which will eventually and habitually bring in the reformation to our church and diocese. We need to ask God for His guidance to do this and start from some point.